I found this interesting...and I imagine PBS will probably show it. "A documentary about the Holocaust partially helmed by famed director Alfred Hitchcock is due to be released in full for the first time. The Independent reported Wednesday that the documentary will be shown in tandem with a new documentary, "Night Will Fall," at festivals and in theaters, as well as on British television to mark the 70th anniversary of the end of World War II. Hitchcock was approached in 1945 by his friend and producer Sidney Bernstein about the possibility of helping with a documentary based on footage shot in the Nazi concentration camps by British and Soviet army units. Upon first viewing the footage, the director of "Psycho" and "The 39 Steps" was reportedly so traumatized that he avoided the film studio for a week. The project took longer than anticipated and by the time it was ready, in late 1945 the Allied military government in Berlin decided the film would do more harm than good to the effort to pacify the defeated Germans. Five of the original six reels of footage shot were placed in a vault in the Imperial War Museum in London, where they were discovered in the 1980s by an American researcher. The unfinished film, in which Hitchcock was credited as a "treatment adviser," was shown at the Berlin Film Festival in 1984 and on PBS in 1985 under the title "Memory of the Camps". In the years since, the Independent reports, the film has been digitally restored, and material from the missing sixth reel has been rediscovered and pieced together by the Imperial War Museum. Dr Toby Haggith, Senior Curator at the museum's Department of Research, tells the Independent that the completed documentary will be renamed, though he did not reveal the new title. "Judging by the two test screenings we have had for colleagues, experts and film historians, what struck me was that they found it extremely disturbing," Haggith told the paper. "One of the common remarks was that it [the film] was both terrible and brilliant at the same time."" When you view this, don't forget the Persian's renamed their Country Iran which translates as Arian. "The term Iranian is derived from the Old Iranian ethnical adjective Aryana which is itself a cognate of the Sanskrit word Arya. The name Iran is from Ary&#257;n&#257;m; lit: "[Land] of the Aryans". The old Proto-Indo-Iranian term Arya, per Thieme meaning "hospitable", is believed to have been one of the self-referential terms used by the Aryans, at least in the areas populated by Aryans who migrated south from Central Asia. Another meaning for Aryan is noble. In the late part of the Avesta (Vendidad 1), one of their homelands was referred to as Airyanem Vaejah. The homeland varied in its geographic range, the area around Herat (Pliny's view) and even the entire expanse of the Iranian plateau (Strabo's designation)." The whole Nazi occult link is really weird. I was never ever taught much about Hitler in my schooling. The occult thing was new to me until I started seeing the documentaries on TV. A Russian guy I worked with, who was into the occult and also Jewish in lineage but not faith, knew about the Nazi occult link. We were taught in our schools about what Hitler did. But I think that most things were basically "watered" down so to speak. I would like to know the whole truth about things. But at the same time I feel I really don't want to know because it will just prove to me that some people are just more sick than anyone should ever really be. 6 million Jews killed in the concentration camps -- I don't know how much more Truth you need! The entire population of an average U.S. state -- e.g. Wisconsin -- wiped out in a few years. If you want more details on the way they treated people, there are two movies everyone should see: "Schindler's List" and "The Pianist." Both are superbly entertaining, while remaining educational and enlightening -- even uplifting! I really wonder if it's all true, 6 million Jews - sounds like too much to be possible, really! Awwwww, 6 million ain't so bad! Tip of the iceberg. You could argue that WWII would never have occurred if Hitler hadn't been born. Total death toll for WWII was at least 40 million. Stalin was responsible for 10 to 30 million deaths (depending on who's counting) in Russia alone. Then there was the Black Plague that wiped out between 75 and 200 million, or we could look at the abortion death toll of 53 million in the U.S., and 400 million in China. I think most people do not realize how much Hitler was into the Occult and such. I knew a little about it because I did my own study of it after learning about WWII because I was curious about what would motivate a man to do what Hitler did. It is interesting and terrifying at the same time and I can see why many people gloss over that aspect of Hitler's legacy and tend to shy away from it. So today we're trivializing the Holocaust. Great. Hey Aaron, I don't think Rick meant for his post to come across as trivializing the Holocaust. Horrible time that we should all remember and reflect on to try and prevent something similar from happening again! Agree, it was just an attempt to put the Jewish holocaust in perspective by acknowledging other global atrocities with even higher death counts. It should not be forgotten, nor should the other devastating losses mentioned. No disrespect to Rick, I just don't care for the trivial manor of his first sentence. People make comparisons all the time with loss of life and grotesque events in history, and honoring one over another isn't ever a good thing but damn, 6 million lives IS DEFINITELY bad. Yup, the loss of just 1 is bad, worse as you see bigger numbers. Should we just agree to table that aspect of the discussion then for now? I'll watch the documentary when I can and its released since I think it will be interesting to see. Separately, does anyone know if this documentary has a release date yet? Or if it's released yet? It bothers me that as time progresses atrocities such as the Holocaust and slavery are not taught in schools as much as they were in the past. I remember being in school and watching The Diary of Ann Frank as well as various movies on slavery. I wonder why school boards don't feel the need to incorporate these topics into the new curriculum's. Our youth need to know true history and not just the bits and pieces that some officials seem to think are important. Every hear of satire, bud? Satire: the use of irony, sarcasm, ridicule, or the like, in exposing, denouncing, or deriding vice, folly, etc. I think doubting the 6 million figure falls into the category of vice or folly. As I noted, there were far more victims if you add them up. Holocaust denial is an alarming trend. Derision is appropriate. Here is the original penultimate book about the Holocaust and as the synopsis says, many of the images are genuinely haunting. This book will eliminate any illusions anyone has of the Holocaust. It is still available in hardbound and paperback. "Originally published in 1960 in German as Der Gelbe Stern, this landmark book was one of the first comprehensive photographic accounts of the Holocaust. During the 1950s, researchers in Washington, D.C. and London poured over more than 1,500 tons of photographs and documents seized after World War II. In 1960 Gerhard Schoenberner gathered some 200 photographs from the newly uncovered material, most of them taken by Nazis to chronicle their war against the Jews. 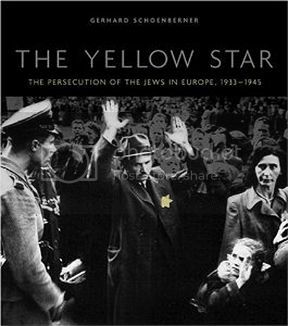 Schoenberner named the book after the yellow badge that the Nazis forced the persecuted Jews to wear. There are many aspects of WWII that many people do not know about and many people who few people know of. Audie Murphy, Bonhoffer, and Himmler are just some of the names that only a few people know the story behind. Grand Admiral Karl Doenitz is another person of significance that few know about. After Hitler killed himself, he became Germany's last Fuhrer. At the Nuremburg Trials he was not convicted of war crimes, thus not sentenced to death. He was imprisoned until 1956 (if my memory holds) only for contributing to Germany's war efforts. A fascinating man with a wonderful (U-Boat) tacticial mind. For the interested, I recommend a book: Doenitz the last Furher by Peter Padfield. Thanks for the book recommendation! I've read about Doenitz before, but never a full book, etc. The submariners of WW2 on both sides of the conflict still provide the basis of study today, so I'm sure the book would be informative.